Imagine my surprise when, after recording the All About Cookies podcast, I discovered a blog oversight of the first order. 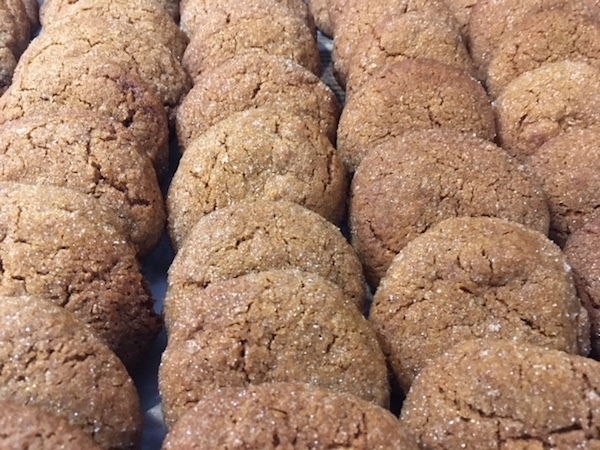 No recipe for Gingersnaps (AKA Molasses Crinkles) has been published before on this website. Today’s post rectifies the situation. The original recipe is from a cookies and candy cookbook Jolene received as a wedding shower gift in 1977. We updated it to make it lower in sugar, whole wheat, and dairy free. Preheat oven to 375°. Cream together shortening, brown sugar, molasses, and eggs until light and fluffy. Stir together dry ingredients; stir into molasses mixture until well-blended. Form into small balls. Roll in granulated sugar and place 2 inches apart on heated baking stones. Bake for about 10 minutes. Remove from pan immediately. Makes about 8 dozen cookies.